Get that classic look and feel thanks to Hogue, Inc.'s modern milled checkered panel handgun grips (model no. 45811). 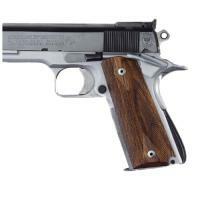 These grips are inlet on modern computerized machinery (CNC) to fit Colt and 1911 government models and then hand finished on factory frames to make certain these have the cleanest fit possible. The wood used to make these panels are fine kiln-dried hardwoods which are much denser - and harder - than traditional walnut. They are etched with a checkered pattern to offer a nice, solid grip on the handle. And these won't ever crack or peel thanks to the non-slippery Canuba wax that is hand polished into the wood. Hogue has the gear you need to "Get a Grip" and you'll never want to let go of these high-end fancy Coco Bolo wood grips. Product Dimensions: 8.2 x 4.5 x 1 in.